Garson, G. D. (2012). Curve Fitting and Nonlinear Regression. Asheboro, NC: Statistical Associates Publishers. Both curve fitting and nonlinear regression are methods of finding a best-fit line to a set of data points even when the best-fit line is nonlinear. Below, curve-fitting is discussed with respect to the SPSS curve estimation module, obtained by selecting Analyze > Regression > Curve Estimation. This module can compare linear, logarithmic, inverse, quadratic, cubic, power, compound, S-curve, logistic, growth, and exponential models based on their relative goodness of fit where a single dependent variable is predicted by a single independent variable or by a time variable. As such it is a useful exploratory tool preliminary to selecting multivariate models in generalized linear modeling, which supports nonlinear link functions. (Generalized linear modeling is treated in a separate Statistical Associates "Blue Book" volume). The province of nonlinear regression is fitting curves to data which cannot be fitted using nonlinear transforms of the independent variables or by nonlinear link functions which transform the dependent variable. 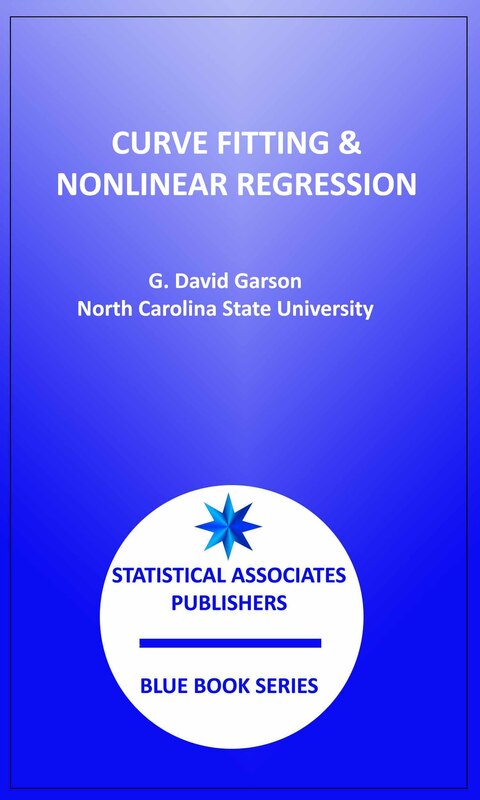 This type of data is "intrinsically nonlinear" and requires approaches treated in a second section of this e-book, which covers nonlinear regression in SPSS, obtained by selecting Analyze > Regression > Nonlinear.